Great Scott!! A murder is revealed, a body is found, a culprit is at large. With its original story line and plot twist, this exhibit is guaranteed to leave visitors puzzled and scratching their heads. A fun time for family and groups the exhibit is a must to see. 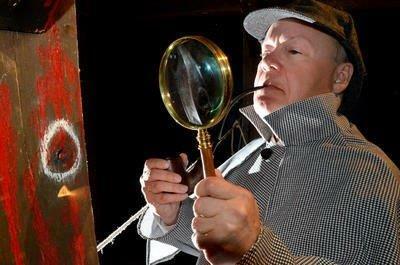 So put on your deerstalker hat and take out your magnifying glass because it’s time to solve a mystery. Sherlock Holmes and the Clocktower Mystery is a highly interactive and wildly entertaining murder-mystery that will test visitor’s powers of observation and deductive reasoning. Visitors will need a thinking cap and deerstalker to solve this baffling mystery. The exhibit is ideal for older children and adults and is especially suitable for family or group participation. As visitors enter the exhibit, they find themselves transported back in time into Sir Arthur Conan Doyle’s Victorian London. The darkened exhibition spaces are filled with the sounds of hansom cabs, street vendors and distant foghorns. With pencil and exhibit guide in hand visitors set off to follow the story of the Clocktower Mystery as told by Dr. Watson himself! Once visitors think they have solved the mystery and know the name of the murderer, they enter into the study of the Victorian detective himself, Sherlock Holmes, (who is played by a live actor). The visitor’s conclusions are discussed, and the mystery is solved in a dramatic finale. Visitors to the exhibition are exposed to reading, deductive reasoning and physical sciences and are given a painless lesson in the scientific method of problem solving. Careful observation of sights sounds and smells as well as intellectual probing are required to become a master sleuth. The exhibit is “turn-key” and comes complete with all walls, furniture, decorative and architectural elements, instructions, script, clues, smells, lights, a live actor and sounds to make a successful exhibit.